Mamma mia, those are BIG & HEFTY seed packets! Gigante di Perugia! Italian seed packets are always HUGE! I love Italian seed packets because there’s so much to love. The graphics are huge, the packets are huge (5″ x 8″) the contents, again, huge, and the brilliant and thorough cultivation information cleverly done with idiot-proof symbols and signifiers requiring no language skills ( and I’m not just talking about italian language skills, I mean any skills at all, in any language) are pure genius. I thought the company called FOUR was unique in its packaging pizzazz and seminal largesse but today’s delivery of seeds from Bavicchi in Perugia indicates otherwise. Gigantic! Tremendous! Fantastic! Is there more to love? Oh yes there is…seed viability dates and germination rates. I have never seen a packet of Burpees seeds that indicates its contents’ viability dates. They usually print something like “Packed for 2009” or “SELL BY 2009” but that could easily lead one to think that the seeds lose viability after that date and must be discarded and replaced with fresh seed the following season (call me a cynic but I believe that’s the idea). Well, there are, in fact, some seeds whose germination rates decline after one year or even lose viability entirely but they are the exception, not the rule. 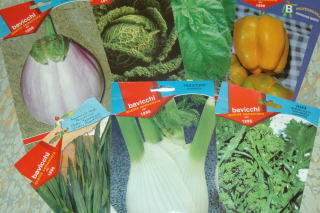 My Bavicchi seed packet for Eggplant tells me that it was packed in 2009 and remains viable through 2012. It also tells me that the seeds will do best in a ph5.5 – 7.5, the distance and depth by which to plant them, the rate of germination, how much ground this packet will cover and that 100grams of this particular eggplant provides 18 calories containing Vitamins A, B1, B2 and C. Were these the most expensive seeds I purchased? Not by a longshot. In fact, there are so many seeds that I may be giving some away as gifts. Bravo Bavicchi!! This is a partial picture of the garden palette we have to work with. We continue to propagate new plants in the greenhouse, tiny though it may be, and even direct sow seed for some perennials in the spring and fall (with varying degrees of success) but there are gaps. Gaps in the gardens, gaps in the variety of plants we have to propagate, and gaps in our attention to taking cuttings at the right time. Other than the monsterously large Shasta daisies, enormous clumps of agastache and the rampantly self-sowing anthemis (which we want less of) the gardens are still too young to do much propagation by division. What’s missing from this picture? Where would I begin with such a wish list? More delphiniums of every shade and hue, more hollyhocks (they grow like weeds everywhere else but not here), lavender and plenty of it, oriental poppies, lady’s mantle ( a truckload), dianthus gratianopolitanus (pinks, not Sweet William), geranium psilostemon (we’ve killed three of these, effortlessly), more columbines, more anemones, hakonachloa macra ‘Aureum’, yucca filamentosa ‘Color Guard’, heucheras, hostas, foxfloves, myosotis sylvatica, more daffodils, more tulips, eremerus (which seems not to work here, suspected hardiness issue) and a greater variety of siberian irises. Perhaps its time to start planning a pot-luck plant party.